The investigation work continues at the Capitol to preserve our state's historic treasure and will continue through July. Crews are working on the next phase of investigative work in the Wyoming State Capitol to uncover the building's structure for further analysis. In the process, the workers have been uncovering hidden arches and historic paint. Over the course of its 125 year plus history, the Capitol has undergone numerous additions and renovations. Although there are record documents of the existing conditions, not all conditions and exact measurements are known. This work started on April 20, 2015 and will continue for six weeks. The 1888 photo,courtesy of Wyoming State Archives, shows some of the arches in the center building of the Capitol as work started on the completion of the two wings. Another arch was discovered on the third floor on the Senate side--by the elevator. Earlier in the week, crews identified an area to do investigative work to find out what the structure looks like behind the dropped ceiling. This was taken on the second floor of the Capitol near offices. A closer look show historical paint, which was uncovered after investigative work removed ceiling in an office on the second floor of the Capitol. Once they carefully removed the layers, workers uncovered an arch. This was taken on the second floor of the Capitol near offices. In 1888, the center or main building of the Capitol was occupied by the Territorial Legislative Assembly and work had started on the completion of the two wings. 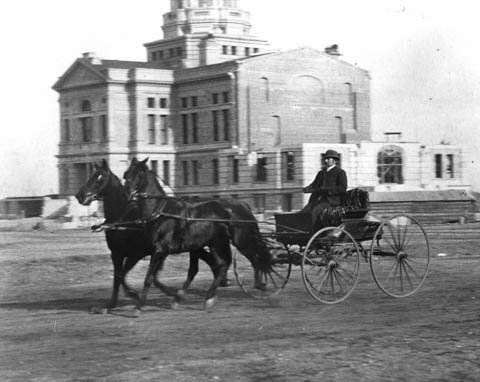 This 1888 photo is courtesy of Wyoming State Archives. Work crews take every precaution when removing layers of old wall or ceiling. On April 29, 2015, workers removed four historic pendant lights from the second floor of the Wyoming State Capitol.